Do not challenge Lexi Bando to a game of HORSE. And do not expect Ruthy Hebard to miss a shot anytime in the near future. Those are two lessons USC learned the hard way Friday night as No. 9 Oregon outlasted the Trojans 80-74 in double overtime inside Matthew Knight Arena. With the win, the Ducks moved to 24-4 overall and remained in a first place tie with Stanford as both teams are 13-2 in league play. USC was hoping to go on the right side of the NCAA bubble with an upset win on the road. But instead that bubble may have popped as the Trojans dropped to 17-9 overall and 7-8 in Pac-12 action. The Ducks will admit the game was a fairly ugly one as they uncharacteristically committed 24 turnovers. What wasn’t ugly, however, was Bando’s three-pointer with 41 seconds remaining in the second overtime to give Oregon a two-possession lead at 78-74. It wasn’t the typical swish of a three everyone is used to from Bando though. The senior’s shot hit the back rim, the front rim, popped up into the air, bounced off the top of the backboard and came down perfectly through the hoop. It’s a shot Bando couldn’t make even if she tried 100 times. But for some reason, the bounces went her way and deflated USC to the point that on its subsequent in-bounds pass, it went right to Oti Gildon and not to a Trojan. That miracle of a shot was just the last of three huge treys Bando made in the second extra period. She nailed a corner three to give the Ducks a 73-72 lead and then later, a defender fell down leaving the sharpshooter wide open to hit one from the right wing. 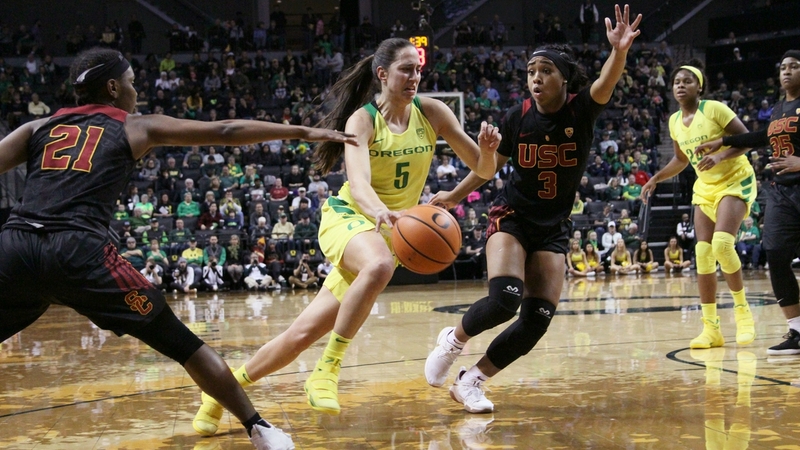 The threat Bando brings from the outside is something Oregon has sorely missed since she injured her leg before the first Civil War game in early January. Bando returned last Sunday as she played just a few minutes against Washington State. She was supposed to ease her way back, but that planned must have been scrapped. The senior and Eugene native played 32 minutes and scored 11 points. USC’s other tough lesson came at the hands of Hebard. The sophomore followed up her Player of the Week performance by staying perfect from the field. She shot a cool 12-for-12 from the field for 27 points and 10 rebounds. Hebard has made her last 30 shots over her last three games, which is an NCAA record. She’s also 37 of her last 39 attempts from the field. But not one of those shots came easy as USC’s Kristen Simon challenged Hebard on both ends of the floor. There were several tense moments between the two, but Simon found out Hebard isn’t one to back down to a tough defender. In fact, it may have fired her up even more. She scored seven points in the overtimes. Simon had a monster game herself with 26 points and 15 rebounds, but she missed a couple of bunnies late in the contest that hurt. Maite Cazorla scored 17 points with six rebounds. Unfortunately, though, it was her missed lay-up that sent the game into the second overtime. But that miscue was just one of many on the night and Cazorla wasn’t alone. Sabrina Ionescu had an off night with eight turnovers. The queen of triple doubles did score 15 points with nine assists. 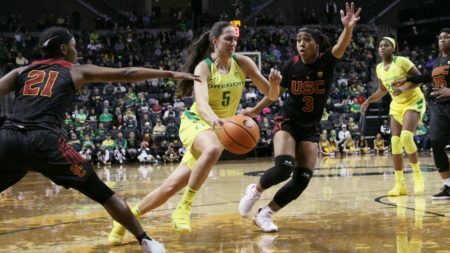 Many of Ionescu’s turnovers were forced as the Trojans played her tight all night long and managed to get their hands on her dribble to steal it from the sophomore. Even with the turnovers and Ionescu not being quite herself, Oregon coach Kelly Graves has to be happy to know his team can fight through all of that adversity in over to win a game. One also has to think Oregon got those things out of its system just in time as No. 7 UCLA comes to Eugene on Monday for an ESPN national telecast. The Bruins will be not only looking to avenge an earlier loss to the Ducks in Los Angeles, but they’ll have an extra day to be upset over their 67-64 overtime loss to the Beavers. That loss dropped UCLA out of a first-place tie with the Ducks and Cardinal at 12-3. The Ducks and Bruins are scheduled to tip off at 7 pm on ESPN.